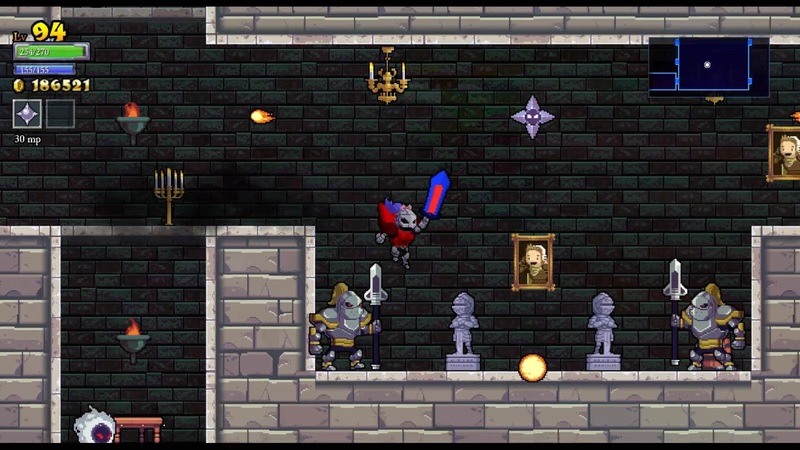 Rogue Legacy was a PlayStation Plus game that I played on PlayStation Vita and I have gone from start to end minus the extra optional bosses which are too tough for me to beat. I have wanted to play it for awhile now and I lucked out and got a chance to play it while it was on PlayStation Plus. You are the descendant of a family bloodline who has spent their life trying to get to the end of a castle that through some magic is ever changing. Your goal is to do what your ancestors failed to do and make it to the end of the castle. In the event that you fail and die, one of your three offspring will inherit your fortune (gold collected by you) and they will continue your legacy. With the gold collected, you will be able to spend it on stats (damage increase, hp increase, mp increase, etc), skills (extra jump, extra dash, life leech, magic leech, etc), weapon and armor. Make sure to spend all that you can because the doorman to the castle will charge you admission which happens to be all the gold that you have on you so you will start at 0. Rinse and repeat until you get to the end of the game. 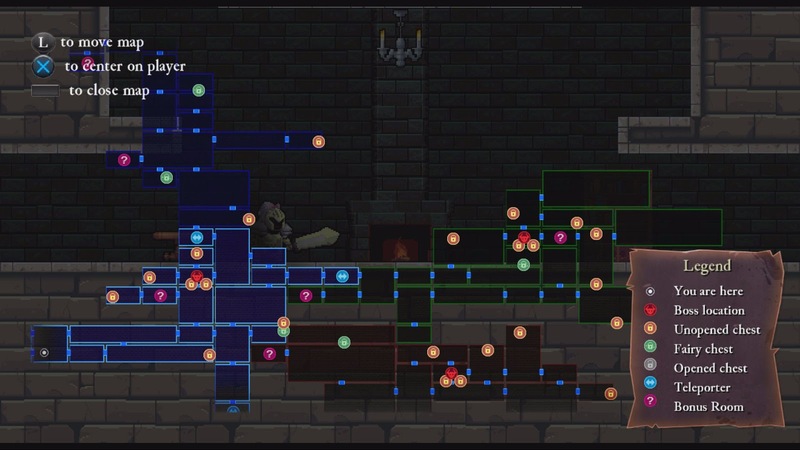 The castle is broken down into 4 areas which have a predefined difficulty level but you may not happen upon them in difficulty order. Generally, the darkness is south, forest is east, tower is north, and you start in the castle area. 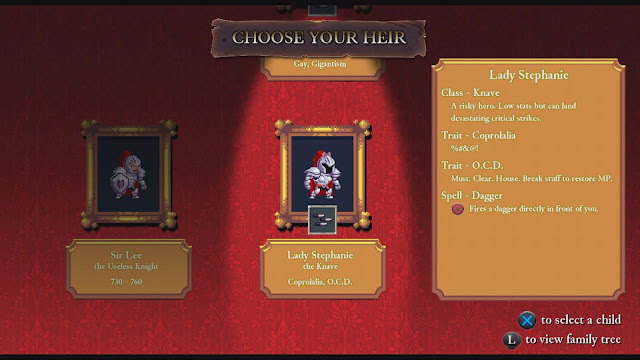 The gameplay loop is simple but works well, you pick an offspring, collect as much gold as you can, die, spend all your money on stats, skills, weapon, and armor, and try to get as far as you can again. In each area, there is a boss, you will need to defeat all four bosses before you can reach the last boss. Once you have beat the boss, the boss is always defeated, so you don’t have to worry about beating all the bosses in one go. Just to make the game a little bit difficult, your offspring may have deficiencies that make the game a little bit harder/easier or have visual changes to your game. For example, you would have dwarfism which makes you short, however, it unlocks areas where you cannot reach if you are normal or giant sized. Or you can have colour blindness and everything is black and white but otherwise doesn't change gameplay. Along with this, your offspring are broken into one of several classes such as the knight or the mage or even dragon (yes, dragon). 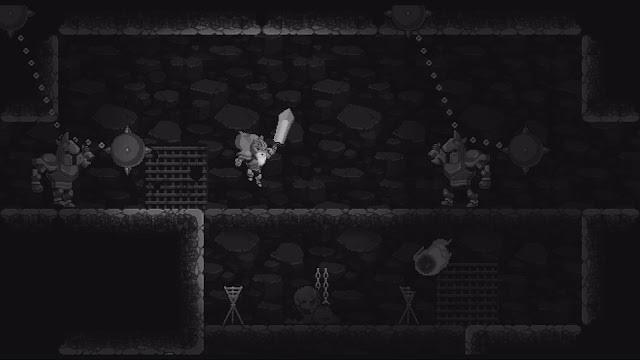 The gameplay itself is simple 2D platformer where you jump, attack, and you have potions and fountains and such to heal as you progress through the level. I won’t go into details but it works and plays well and I don’t get frustrated with losing due to poor controls. After I got into the swing of things, the game plays really well and I thought that it was a really good game and if you watch a gameplay video, you will have an idea of how it will play and you will know what you are getting into. Even though I did not pay directly for the game, if you haven’t played it, I could easily suggest this game for most people. Come back next Wednesday for my Final Thoughts on Life is Strange for PlayStation 4.